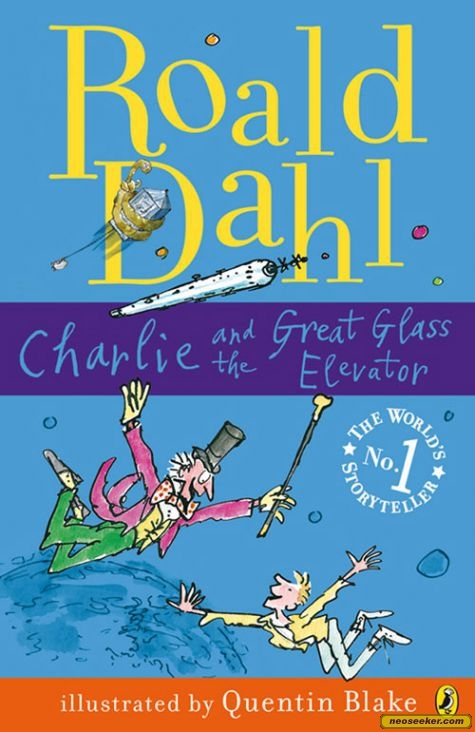 After reading Charlie and the Chocolate Factory aloud to my kids, I received strong counsel to proceed on to its sequel, Charlie and the Great Glass Elevator . My children were quite game to give this one a go and so we launched into this book and were launched into one of the most bizarre stories I've ever read. If you haven't read Charlie and the Great Glass Elevator I would personally say that you shouldn't feel guilty about it. No need to re-arrange the reading stack to get to it post haste or anything. However, I also realize that the chances are high that I am in the minority on this one so don't mind me (much) and do whatever it is you are going to do. When we left Charlie he was the new owner of the Chocolate Factory. Mr. Wonka, Charlie and Charlie's Grandpa Joe had gone to pick up the rest of the family in Mr. Wonka's Great Glass Elevator in order to bring them back to the factory. In this sequel, the family is on their way back to the factory when the Grandmas in bed start fussing and hollering, causing Mr. Wonka some troubles with his elevator. The family and Mr. Wonka end up in outer space where they board a new U.S. Space Hotel and are greeting by man eating aliens who chase them away again. The family manages to escape back to earth, after annihilating the aliens and saving the lives of others who had traveled to the Space Hotel. Upon arriving back at the factory, Mr. Wonka introduces Charlie's elderly relatives to Wonka-vites which will take 20 years off their lives (per pill taken). The Grandparents go wild with the pills in an effort to be young again, only Grandma Georgina takes too many pills and minuses herself out of life. Mr. Wonka and Charlie travel to "Minusland" where they locate the ghostly, non-existent Grandma Georgia and bring her back to the land of the living. In the end, everything is set to right but only in the weirdest fashion. Reading Charlie and the Great Glass Elevator was an experience. That's probably the best thing I can say about it. I think that was one of the first books my oldest read that I hadn't read with or before him. There comes a time when you just can't keep up with everything they read, and they have more time to read than you do. I know he enjoyed it and it was quirky, but that was about all until now. I think we probably must have talked about it back then but I don't remember anything about it except that he loved it. But he likes quirky and offbeat. I've only read 3 Dahl books, both Charlie books and James and the Giant Peach. I like all three of them, but I think you have to be young enough the first time you read them to really appreciate them. You must admit, Vermicious Knid is really fun to say. Dahl is a strange strange straaange person.